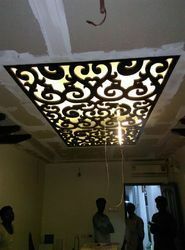 As per the needs and requirements of our clients, we are involved in providing MDF Jali Grill. Owing to the rich industrial experience and expertise in this business, we are involved in providing MDF Grill Board. In order to keep pace with never ending demands of customers, we are instrumental in presenting MDF Grill Board. This MDF Grill Board is widely demanded for various interior designing applications. Moreover, at most affordable price, customers can purchase this product from us.